Our Derma rollers are UV/Gamma sterilized for your protection and are made from stainless steel and titanium with 0.5mm micro tips for this particular model. After cleansing the face as usual, Carefully and slowly roll your skin in all directions, 3 to 4 times with your derma roller. After roller treatments, apply 3 to 5 drops of our Hyaluronic Acid and Vitamin C serum to your face with a dropper ad gently tap until absorbed. After this process, gently apply a small amount of Centella Soothing Cream to the treated areas to reduce any redness. 1. Our Premium Derma Roller is made with fine Medical Titanium Needles (many other Chinese sellers use all stainless steel) Therefore, we ensure the highest quality product in the US. 2. 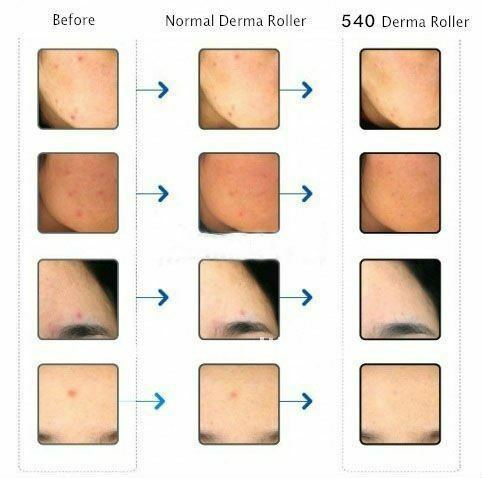 All Of The Needles Are Sterilized By UV and Gamma While Other Derma Rollers Are Mostly Not. 3. All packages are sealed in high sterilization packages. Moreover, every of our Vitamain C serum is packaged with Bubble Wraps! Safety Guaranteed! 4. We OFFER the FASTEST SHIPPING IN THE US. Most Importantly, We offer FREE SHIPPING!! WE ARE PROUD TO BE THE US SELLER! !